A biweekly tour of the ever-expanding cartographic landscape. Welcome to the latest edition of MapLab. Sign up to receive this newsletter in your inbox here. Two years ago, a group of Detroit municipal leaders took a van trip around the city. Disused parks, blocked sidewalks, and decapitated street signs scrolled past the window in some of the more depopulated neighborhoods. The leaders were on a mission: to better coordinate their agencies—public works, public safety, IT, and others—towards Mayor Mike Duggan’s longstanding goal of beautifying Detroit. But when they got back to city hall, remembers Dexter Slusarski, they realized they were missing something foundational: a shared map of the city’s assets, easily accessed and updated by all. 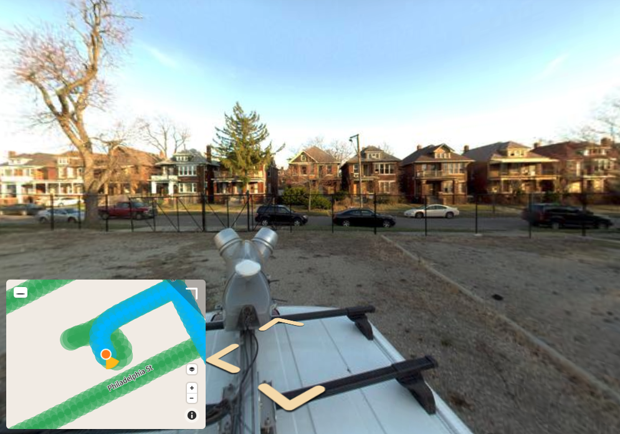 That’s when Slusarski stepped in, and when Detroit embarked on its current journey to become the best mapped city in the U.S.
Slusarski had previously worked at Loveland Technologies, a digital surveying startup tracking foreclosures and blight in Detroit. He was handed city cash to strap GoPro cameras to a beat-up van and drive down every street in the city, snapping pictures foot by foot. 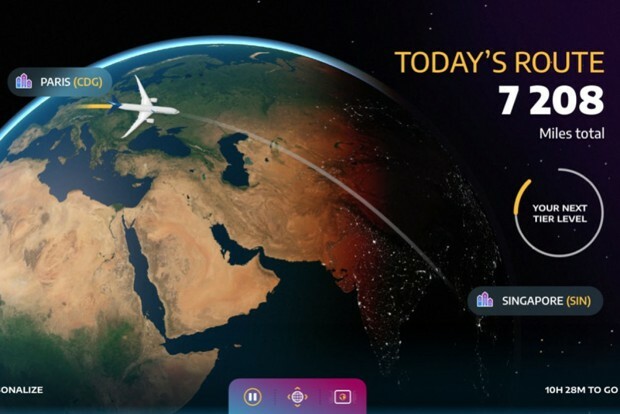 He uploaded them to Mapillary, a crowed-sourced mapping platform similar to Google Street View, which links images to geographic coordinates and pastes them together into a cohesive map. Slusarski and his team built software that allowed city officials to search for particular properties and pin tasks to particular spots. The beta test was a hit. So last November, Slusarski and his team launched a scaled-up, spiffed-up version. Now the city is on an ambitious quest to create a new map every year, hitting the road with a new vehicle specially equipped with lidar and a 360-degree-view camera capable of capturing the city’s streets and alleyways in minute detail. 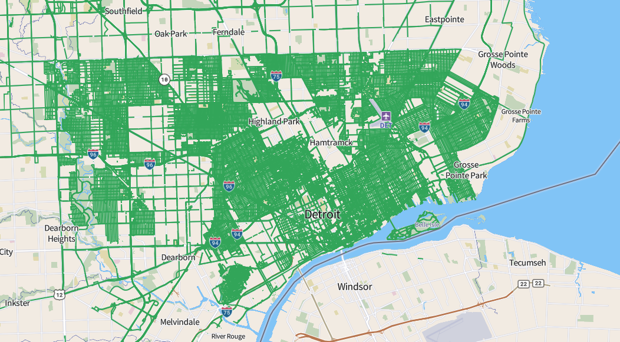 The city has uploaded 743,800 of those images to the Mapillary platform, which represents about half of the city’s roughly 2,900 miles of roads. The pictures, and the map, are available for anyone to peruse and use. That means regular citizens can make use of them, too—for, say, lobbying unresponsive city leaders to address unplowed snow or replace a missing street sign. In some of Detroit’s most neglected areas, these aren’t uncommon experiences. That will be the test for this project, of course: whether the map actually translates into better city services and a higher quality of life for Detroit citizens, regardless of what neighborhood they live in. In case you missed it, my CityLab colleague Kriston Capps took aim at a very high-profile abuse of EB-5, a federal program that offers visas to foreigners who invest large sums of redevelopment dollars in poverty-stricken areas. Hudson Yards, the widely despised $25 billion mega-development that recently opened on Manhattan’s West Side, will now forever be the poster child for the “creative financial gerrymandering” that EB-5 has inspired, Capps writes, since that’s how the project raised at least $1.2 billion of its cash. [...] Hudson Yards, on its own, can’t qualify as a distressed urban area. However, when Congress created the EB-5 visa as a part of immigration reform legislation in 1990, lawmakers did not specify how states should draw up the geographic boundaries for a TEA. 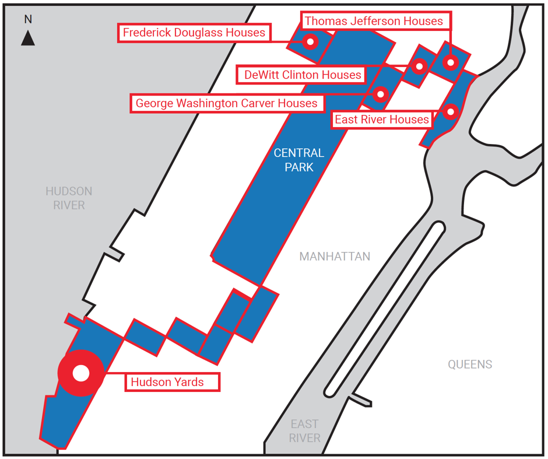 Beyond the park, the qualifying zone for Hudson Yards captures several census tracts in Harlem, where public housing projects boost the overall unemployment figure. Questions, comments, concerns? Email me. And remember to sign up your friends for this newsletter.